This page applies to ALL SCLA PARTICIPANTS. As good shepherds of Lacrosse WE (SLCA Board Members, Coaches, Players & Parents) should all follow the simple guideline of leaving the equipment we use and facilities we participate on in better condition than when we arrived. The SCLA is a volunteer organization, please treat things like they are your own and pick up after yourself! Equipment Carts are located in the south-west closet of the LAX SNAX building. An age group appropriate SCLA Director will coordinate access to the closet. 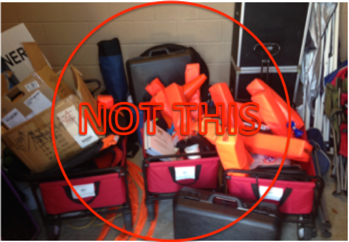 The Equipment Closet should look something like this BEFORE & AFTER each use. If the closet looks like the image on the right, snap a photo and email it here . 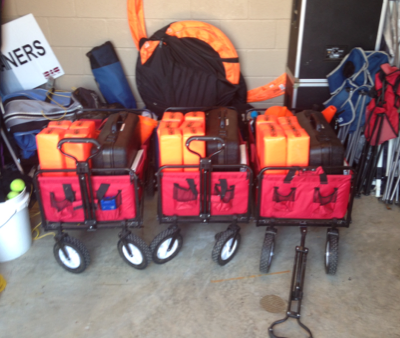 Each Equipment Cart has a field appropriate # on it ( 1 - 3). Please use the appropriate cart as it contains the scoreboard controller specific to that field. Each Equipment Cart should look like this BEFORE & AFTER each use. If a cart doesn't look like this, snap a photo and email it here . A SCLA Field Binder including Scoreboard controller instructions. Note: You should not have to configure the scoreboard. Plug it in, turn it on and it should work. If not, read the instruction manual. Still having issues, ask an SCLA Director or email for help. Note: many find it easier to use their phone or note the time via the game clock. This is typically a black leather bag. It should contain Ice Packs. Replacements are in the closet and at LAX SNAX. LAX Gear Replace Parts - Helmet screws, etc. 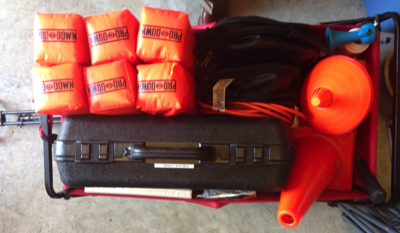 If items are in poor condition, not working, need replacement (Lacrosse Balls, Air Horns, etc.) or for general questions suggestions or concerns please email .